Win A Free Copy Of Play 2 Learn: An iPhone / iPad App That Helps Your Child Learn To Read and Talk! You are here: Home / Giveaways / Win A Free Copy Of Play 2 Learn: An iPhone / iPad App That Helps Your Child Learn To Read and Talk! As a parent (and an Apple geek) I’m always on the look out for fun (and free) educational iPhone / iPhone apps. I mean who isn’t!? That’s why I’m excited to giveaway 5 copies of a new learning app that isn’t just fun, but helps your child learn to talk and read as well. Talk about a double win! The app (Play 2 Learn) was created by a speech therapist who was inspired to create the app while working with one of patients; a little girl who born with Neurofibromatosis-1 (NF1.) (How cool is that!?) I think the fact that this app was created (and is being used) by an actual speech therapist is especially important. It’s nice to know there’s actually research and development behind the app, and that it’s goal is to help your child learn! Play 2 Learn will help your child learn to read and talk by making learning fun as it integrates technology, colorful images, and fun sounds.f It works on all iPhones, iPads, and iPod touches, and we’ve got 5 copies to give away! I can’t wait to get this awesome app into your hands! Play 2 Learn: What Sound? is a fun and educational game that teaches your child to discriminate one sound from another. Being able to match a sound and the corresponding picture addresses your child’s auditory discrimination skills-this means your child’s ability to understand the differences between sounds and the ability to discriminate one sound from another. This motivating game will help to improve your child’s ability to discriminate the sounds in English, which will help speech development as well as literacy skills. The vibrant pictures and stimulating sounds provide a motivating activity so that your child will learn as they play! 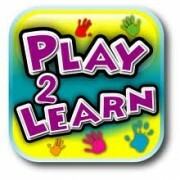 Play 2 Learn works well on all your i-devices. Grab a free copy, here’s how! We’ve got 5 copies of Play 2 Learn to give away, and we’ve made it super simple for you to enter to win of of them….for free! In fact there are several ways for you to enter to win and you can do as many of them as you want. The more ways you enter, the better chance you have of winning! The contest will run from today until Aug 14, 2012 at 12:01 am, EST. (In other words today through the end of Monday) and winners will be announced on Tuesday, August 14th! Just click on the Rafflecopter box below to see all the ways you can enter to win a free copy of this app! Update: This giveaway has ended. Congratulations to our 5 winners, and thank you to everyone who entered. Be sure to stay tuned for other giveaways. Would love this app! My son has proloquo2go on his iPod touch with great success!! By the way, what is Proloquo 2 Go? I’ve never of that one. Proloquo2go is a full featured augmentative and alternate communication solution for people that have speaking difficulties. It has a broad range of words and sentences but you can also anything you want that is a personal part of the individuals day to day life. It’s a wonderful app. It’s pricey though. $189.99. My little 6 year old uses Proloquo2go too! We love it. The littles at her home school group are thrilled when Ruthie “talks” to them! Would love to win this app for my son who will turn 4 in two weeks! My Kid’s Health app is a good one to keep track of medical information for all of your kids. It isn’t quite detailed enough (yet!) for all of our medical issues, but the basics are there and the developers are working on one for kids with special needs specifically. I am a huge fan of Noah and your blog! This app would be priceless for our niece Chloe, who has DS and autism. She is 4 and does not yet speak. Anything to help her, especially her ability to communicate, would be greatly appreciated! Ooh… sounds awesome. My kids favorite app is a simple “bubbles” app where they trace and bubbles appear, then you can tap the bubbles and they pop! Surprising how long they will play with such a simple app! We also love the Write My Name App, its got a place to make your own tags and add your own pics. Ru loves to “tag” her little brothers. We love some of the ABA apps. Simple and to the point..they are a good pace, have a plain white background, not too busy…my kids love them! So thankful for your open confessions of love for your amazing blessing! Noah is A-D-O-R-A-B-L-E (Ethan signs “cute when we spell this) Our Ethan is 2.5 and poised to start potty training tomorrow! He knows many signs and is a self-professed “smart cookie”. Hugs all around from him and us! My husband and I have found that we really like the Sign 4 Me app. Levi, who is two, really likes any music apps like Old Mac Donald and the Itsy Bitsy Spider. This looks like a great app! We love all the Auryn & Auracle Read to me books, Dr. Seuss Band and we just Love he Rover browser app that enables flash on the iPad and comes pre-installed with a lot of educational sites like Starfall.com! My 21 month old really loves the Fisher Price apps. They are free too. She loves that the voice and songs are the same as on the Fisher Price toys she has. Those are fun apps! Noah has the apptivity iphone case, have you seen it? It’s pretty fun (and super child proof.) They also make an iPad case, but it seems sort of bulky. Cam has that case for his iPod. It has a build in speaker. We only use it when he takes his iPod to school so he doesn’t wreck it. I really enjoy the app Tap to Talk. My 4 yr old enjoys it. I am a special education teacher and a grandma to a two year old granddaughter. I’m always on the look out for good apps. A recent one that we love is Noah 360! Love the name….your Noah is so adorable!! I am fairly new to the Apple IPhone/iPod world, I haven’t got any apps for my lil one yet. Any suggestions?? I hope we win!! My son is just learning to talk so this app seems perfect for him! We do not have a speech therapist in our town and the closest one is 2 hours away. Our OT has been very instumental in helping us to get apps to help Josiah, my 4 1/2 year old with DS to talk and communicate. Our favorite one is “Talking Photos” Very helpful with the picture exchange and especially communicating with his peers. This sounds like a great app especially as it was desinged/developed by a speech therapist. I am new to all of this and just started looking for apps for my son who will be 1 in September. But am excited to read through all the comments on this post to get ideas. Your blog is full of great information and the community here has invaluable information. Thank you for all your hard work. We have just started my 16 year old on an ipad and have just downloaded tap to talk. Since we’re so new at this we are definitely looking to hear from others who have found some good apps for non verbal communicators. Our 26 year old loves a number of apps (I don’t have the iPad with me, so I can’t name them), but one has a barnyard and animals, another allows her to drag letters around to match the ones in a word, which it then reads to her. She also loves the talking books. We’d love to win the Play 2 Learn app! My sons favorite app is Lunchbox Monkey! Good luck on winning! I’ll have to check lunchbok monkey! I am a special education teacher and would LOVE this app for my classroom! We have some iPads that we can use and this app would be an incredible addition to our library! All 8 students in my classroom have difficulties with speaking ranging in speech that is difficult to understand to no speech at all…YET! 🙂 We have all made amazing progress and aren’t about to stop now! Thanks for creating such a positive blog-you are an inspiration. Casey, thanks for leaving your comment. I appreciate the great work it sounds like you’re doing! Good luck on winning the app. What are some of the apps you’ve used in your classroom that you (and your students) have enjoyed. I am a speech path. who works with the early intervention program, and would love to use this app. The children are so captivated by using technology that it grabs their attention and can keep it for the entire therapy session! We just got our ipad and are still figuring out all the apps that would be helpful. Even if we don’t win the free one I love learning about all the ones that are tried and tested. WE will definitely be checking this one out as our son Jameson is 11 months old and has 2 older sisters that are 2 and 4 that can benefit from it too!! I’ll have to check those out. I haven’t heard of them before! Be sure to add some of your favorite apps / story books when you get time. I’d like to know which ones your children have enjoyed. By the way, I’ve never heard of proloquo2go before several people have mentioned it in this post. It sounds like a lot of people really like it. What do you like about it? Hey James. Thanks for your comment. What apps do you use now? iStoryTime also have some great stories & social story apps that Penny loves to listen to. Eg, Biscuit the Puppy series, The Monkey Pirate, Puss In Boots, etc, there are so many to choose from! Cam is not a “non-verbal” person per say. But his speech is not at understandable to strangers. At home, we are use to his sounds and gestures but outside it’s frustrating for him to get his point across. I am not computer ipad savy etc sould i go 16 or 32 should 3g or 4g THE LONG AND THE SHORT OF IT I NEED HELP!!!!!!!!!!!!!!!!!!!!!!!!!!!!!!!!!!!!!! You’re leaving blog comments, so you must be pretty tech-savvy! 🙂 I just use the 16gb iPad myself, and it’s worked well for me. But if you don’t have a computer that may change things up. What sort of work do you do? Are you a teacher?